In the USC experiment, people were given popcorn before entering a theatre – some buckets were fresh; others were stale. Do you always get popcorn at the movies? Or snack while you’re on the couch watching television? A new paper by USC researchers revealed why bad eating habits persist even when the food we’re eating doesn’t taste good. The study also revealed the surprisingly simple ways we can counter our habits to gain control over what we eat. In an ingenious experiment, researchers gave people about to enter a movie theatre a bucket of either just-popped, fresh popcorn or stale, week-old popcorn. The researchers controlled for hunger and whether the participants liked the popcorn they received. The researchers also gave popcorn to a control group watching movie clips in a meeting room, rather than in a movie theatre. In the meeting room, a space not usually associated with popcorn, it mattered a lot if the popcorn tasted good. 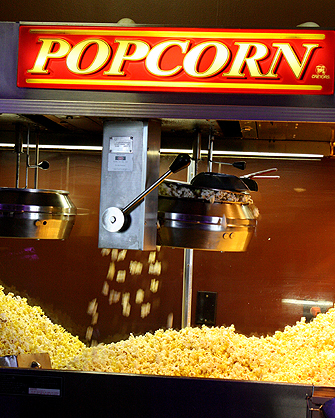 Outside of the movie theatre context, even habitual movie popcorn eaters ate much less stale popcorn than fresh popcorn, demonstrating the extent to which environmental cues can trigger automatic eating behavior. In another movie theatre experiment, the researchers tested a simple disruption of automatic eating habits. Once again using stale and fresh popcorn, the researchers asked participants about to enter a film screening to eat popcorn either with their dominant or non-dominant hand.